I'm Rodney Smith, and I've been hunting since I was 8 years old. I'm based in Portland, Oregon, but I've been to New Zealand about 40 times, and usually manage to combine my business meetings for Sunspots International (a wholesale travel company for the South Pacific) with a hunting trip or two. 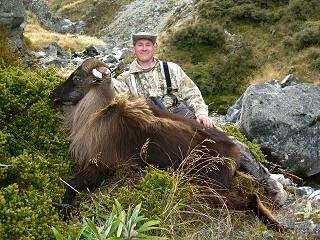 This website is all about hunting New Zealand Tahr: history of tahr in New Zealand, tahr trophy scoring information, where to hunt Himalayan Tahr, and the various tahr hunting packages we offer. Many of our packages offer opportunities to hunt other species as well--see the complete list of our New Zealand hunting packages. I've selected a range of Himalayan tahr hunting packages from my favorite New Zealand outfitters and lodges that I feel offer the best of each kind hunting experience. And, with Sunspots International's 30+ years as a travel wholesaler for New Zealand and the South Pacific means you'll get excellent travel advice plus discounts on airfare and lodging. Himalayan tahr look like large goats, with adult males measuring up to 40 inches at the shoulder and as much as 300 lbs. Males have reddish brown coats in the summer; females are lighter brown. Both males and females are darker brown in the winter. Both bull tahr (males) and nanny tahr (females) have horns, although the males tend to have slightly larger horns, often measuring 11 to 14 inches, measured along the outside curve from base to tip. Originally from the Himalayas in Nepal and India, tahr were introduced to New Zealand by the government for sport hunting in 1904, and were released at Aoraki/Mount Cook. Today tahr can be found in the central Southern Alps, ranging from the Whitcombe and Rakaia valleys down to Lake Hawea. Typically you'll find tahr in the alpine grasslands, where they like to graze on snow tussocks and alpine shrubs and herbs. Tahr are social animals, generally forming two kinds of groups: adult females with yearlings and kids, and mature males in bachelor groups. During the winter breeding season, the males mix in with the females, but when summer comes the males break off and travel long distances away from the females and immature animals. The tahr in these three photos above lives at Lilydale Wilderness Area, very near the house of guide Donald Bray, and is quite tame. Like red stag, chamois, and the other deer species introduced by settlers, tahr have no native predators in New Zealand, which of course brings the challenges of population control. Both the tahr and the chamois are a major threat to many plant species in the alpine regions, and as such, both are classified as pests in New Zealand. The New Zealand Department of Conservation, under the Himalayan Thar Control Plan 1993, utilizes recreational and commercial hunting to keep the tahr population below 10,000. And in case you thought you saw a typo just now, you didn't--"thar" is an older, alternative spelling of "tahr". Locations of some of our trophy Himalayan tahr hunting trips are shown on the map below. Click on any of the markers to see one of the hunting packages we offer for that location.